I'll be back mid-next week with tales of our adventure. Have a great week-end! have a great trip! I went to Marfa a few years ago and loved it, hope you do too. i have no idea where marfa is at the moment but have a GREAT time and show me with lots of pictures when you return!! Have a great trip!!! What a lovely photo too. 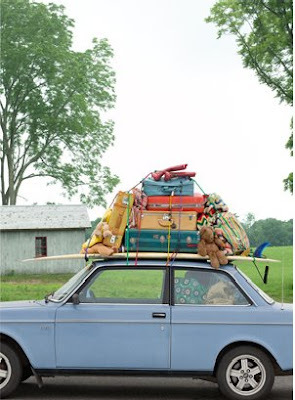 Love this photo - it makes me think of when I head out of town with all the kid gear in tow. Have a fabulous time! Keep up the good work! I love your blog! Marfa. You will have a blast. Go Donald Judd and the Chinati Foundation. Go El Paisano. Love your leaving picture! Hope you have a great time and I can't wait for your updates!